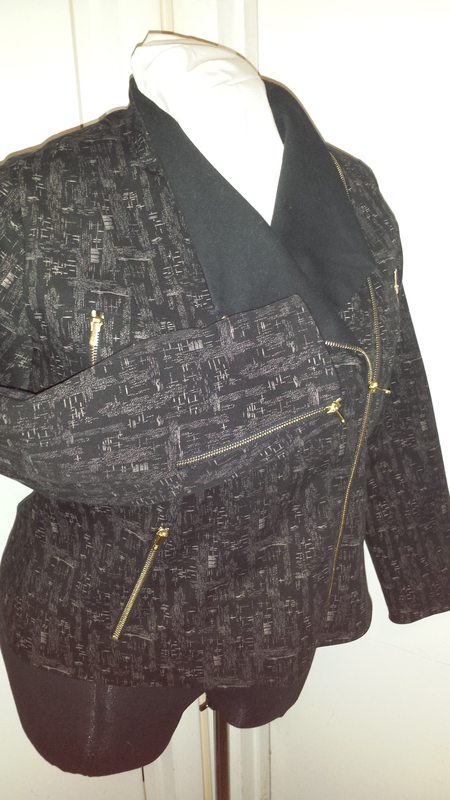 My Motor City Jacket was made with a black and gold stretch denim fabric with a gold cotton print lining (except the sleeves were lined with a black Bemberg fabric to make it easier to slip on and off) It was created as a result of a Craftsy.com class project. The class was “Sew Better, Sew Faster: Smart Construction” and featured the Motor City Express pattern from Islander Sewing Systems. I love the style of the jacket which ultimately became my primary reason for taking the class. I really wanted to learn how to achieve that asymmetrical zipper detail on the front. While the class included a lot of basic sewing information for beginning sewists, I always find little nuggets of information in every class I take. This one was no different. I was able to add three new skills to my sewing repertoire! For this class, I purchased two 36-inch-long zippers. 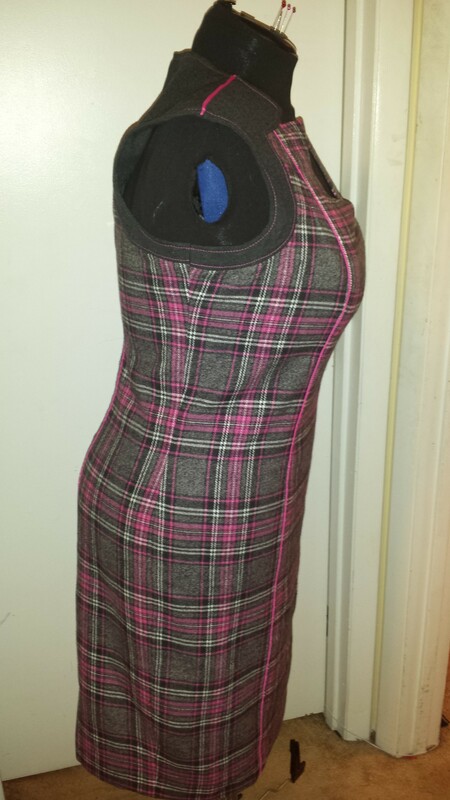 I altered the first one for the asymmetrical front opening and used the second to make all the shorter (5- and 6-inch) zippers needed for the rest of the jacket. I used Riri zippers from Pacific Trimming (as recommended in the class materials). 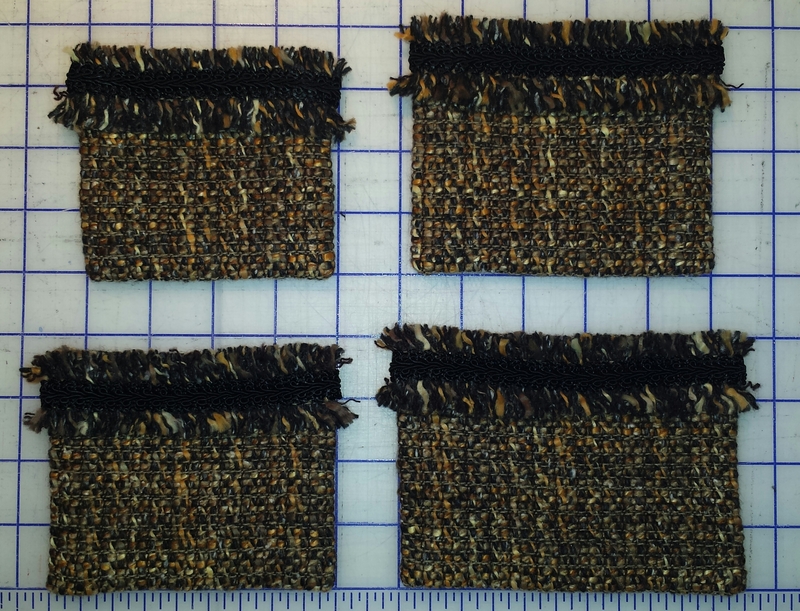 I also ordered enough zipper pulls and top/bottom stops to accommodate the six short zippers. All told, the cost of zipper materials alone came to about $70, but I think it was worth the expense because the zippers really are the primary focus of the jacket. The instructor, Janet Pray, walked through the process for measuring and cutting the long zipper into smaller zippers. After I cut the zippers to the length I needed, the fun part began–pulling the extra zipper teeth away from the tape before adding the zipper pulls and the top/bottom stops. This picture shows one of the zippers after I pulled all the unneeded teeth away from the tape. 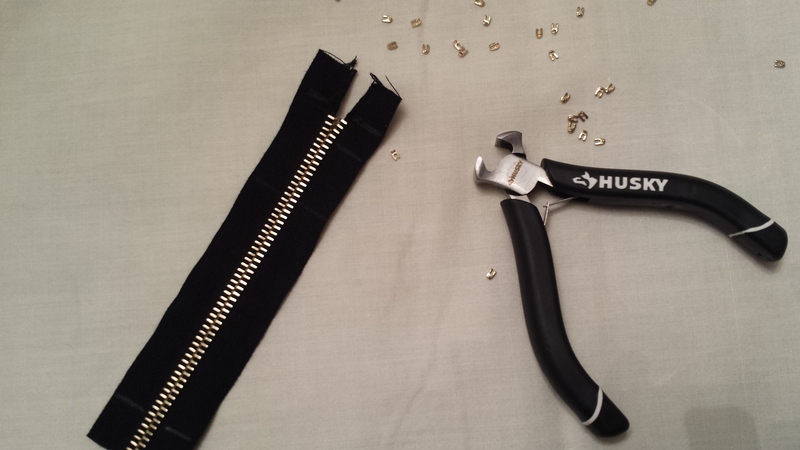 Incidentally, I found a great set of small pliers to add to my sewing notions for less than $8 at Home Depot. I’m sure they will come in handy for future projects–especially since I know I will be making another version of this jacket before too long. I hate to admit it, but in all my years of sewing, I had yet to master the technique of bagging a lining. Bagging the lining is a method of attaching a lining completely on the sewing machine without any hand sewing whatsoever. I’ve seen the technique demonstrated so many times, but every time I tried it at home, I couldn’t seem to get it right. Getting the sleeve hems right was the part that always stumped me. Anyone who has ever learned how to bag a lining can attest to how confusing that sleeve part can be at first. The best thing about taking Craftsy.com classes is that, once you enroll in a class, it’s available to you forever. You can view it again and again for as long as you want. After watching Janet demonstrate that tricky sleeve hem–twice–I tried it again, and it worked! Yay! 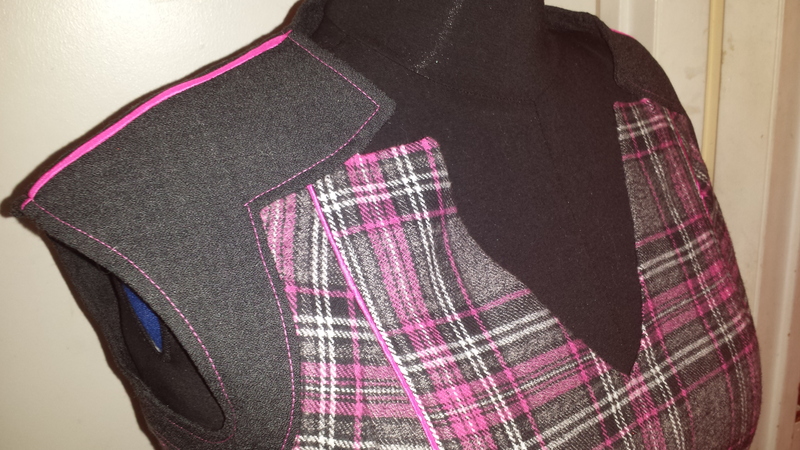 I love making jackets, so this is a major skill to help speed up my sewing considerably. This class also demonstrated how to hold the fabric to sew without using pins, which I would typically do to hold the seams in place before sewing. It’s so much easier to just position your fabric in the sewing machine and zip through a seam without having to pin the entire seam first. Before learning this skill I would pin the seam, then stitch up to the pin, stop to take the pin out, stitch to the next pin, and stop….very time consuming. All of these newly acquired industrial sewing skills will greatly help increase my sewing speed, which will help me to crank out lots of new garments this year. I’ve been working on my Chanel Wannabe jacket for the past several weeks, and it’s nearly finished. 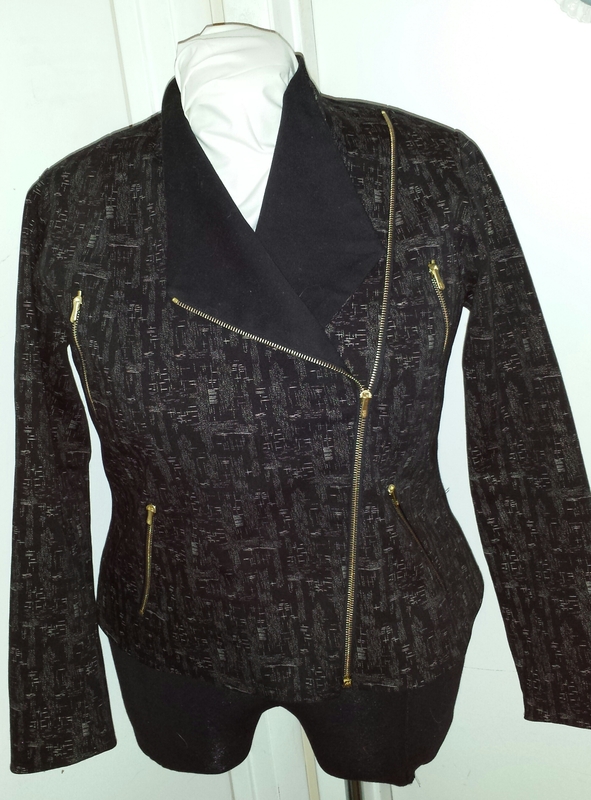 It has been a true labor of love–painstakingly hand sewing much of the jacket together. This jacket (Vogue 8804) is designed to have two large and two small patch pockets. I used couture sewing techniques to make all four pockets–thread-traced the outline for each pocket onto the fabric, added a silk organza underlining for a little extra support, attached the trim with hand-sewn running stitches, and hand stitched the silk charmeuse lining in place. After all that was done, I put the four pockets down on the sewing table and realized that (uh oh) no two pockets were exactly the same size! Wow, did I really do that? Yep, I sure did. The two “small” pockets are on the left side in the photo above, and the two “large” pockets are on the right. It looks like one of the “large” pockets is the same size as one of the “small” pockets. They’re close, but even those two aren’t the same size. 😦 So now I’m making two more pockets. I chose two of the initial pockets, one large and one small, to copy, but this time, I will make sure that the new pockets match the two initial pockets. It just goes to show that, even with decades of sewing experience, sewers can still make bone-headed mistakes. Sewing can definitely teach you patience. By the way, here’s how the back of the pockets look (before and after the lining was attached). 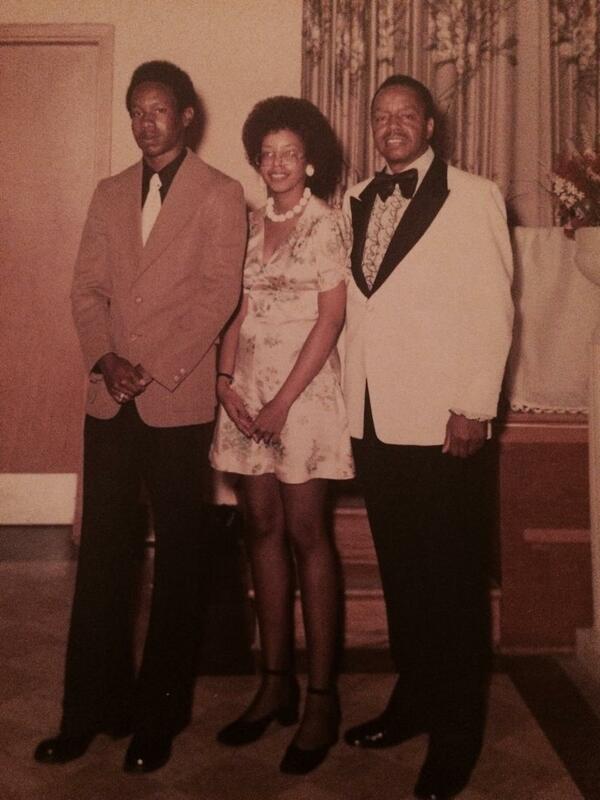 My niece recently found this old picture of me with my brother and dad. I was twenty something at the time and had made this little dress to wear to one of my dad’s vocal performances. What I remember most about the dress is that my dad thought it was too short. 🙂 (Really? I was in my twenties for heaven’s sake!) I also remember that my mom supported me and convinced my dad that the length was just fine. By the way, my dad (at the ripe old age of 91) is still teaching voice and music classes–he is an absolutely amazing man! Over the weekend, I spent some time (several hours) taking inventory of my fabric stash, and much to my surprise, I found that I have more than 350 yards of untouched fabric in my stash! (By the way, that photo at the top of the page is not from a fabric store. It’s a photo from my personal fabric stash.) Yes, I am a fabric junkie, a certified fabriholic. There! I’ve said it. I feel better already. Well, I’ve gone and done it now! I joined the 2015 Ready to Wear Fast. The Ready to Wear Fast involves a group of sewists who have pledged to refrain from buying ALL clothes between January 1 and December 31. For the entire year, we will sew all our clothes–outerwear, dresses, tops, pants, shorts, sweaters, coats, fitness apparel, jeans, and even bathing suits. The only clothing we are allowed to buy are shoes, socks, and undergarments. I’m really excited about this challenge because over the last few years, I’ve become a bit of a fabric junkie. LOL! I have way too much fabric that’s taking up way too much space in my home. This challenge will force me to start cutting into some of that fabric, so I can actually get some of my long-postponed projects finally finished! 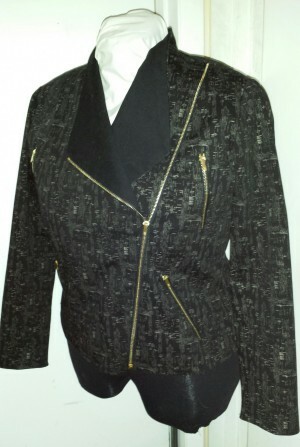 Last year, several ladies who belong to the Maryland Chapter of the American Sewing Guild (ASG) decided to form a group to work on the classic French jacket ala Coco Chanel. We named our group the Chanel Wannabes, and we meet once a month to talk about progress and challenges and to support, encourage, and ultimately learn from each other. 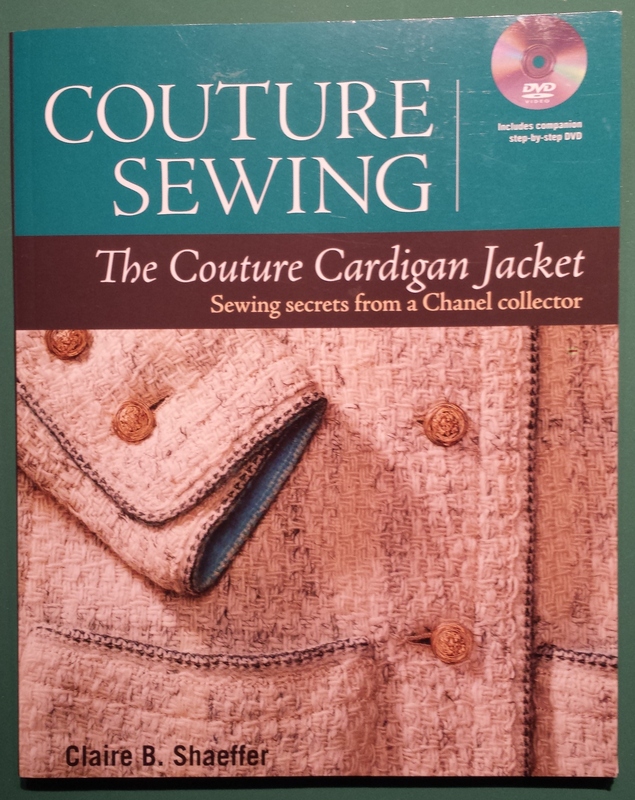 I’m using Claire Shaeffer’s book, Couture Sewing: The Couture Cardigan Jacket (pictured below) to guide me through my jacket construction. 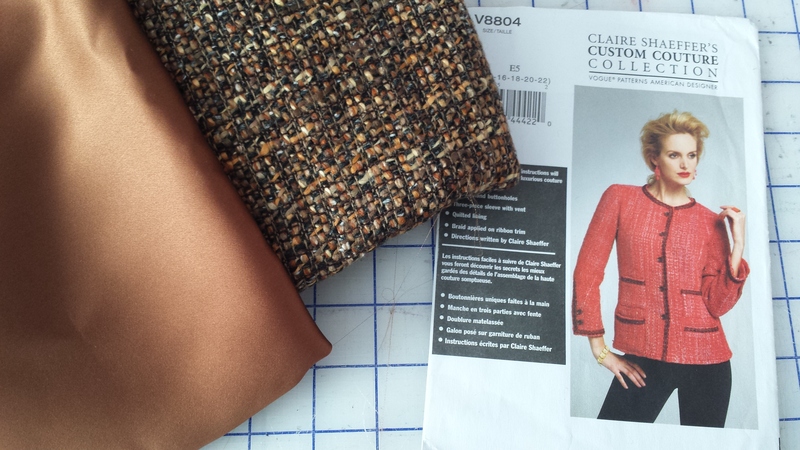 Here’s the fabric, pattern, and the silk charmeuse that I’m using for the lining. I really love the way it’s coming together. We don’t meet again until next month, but I hope to have the jacket done before then. 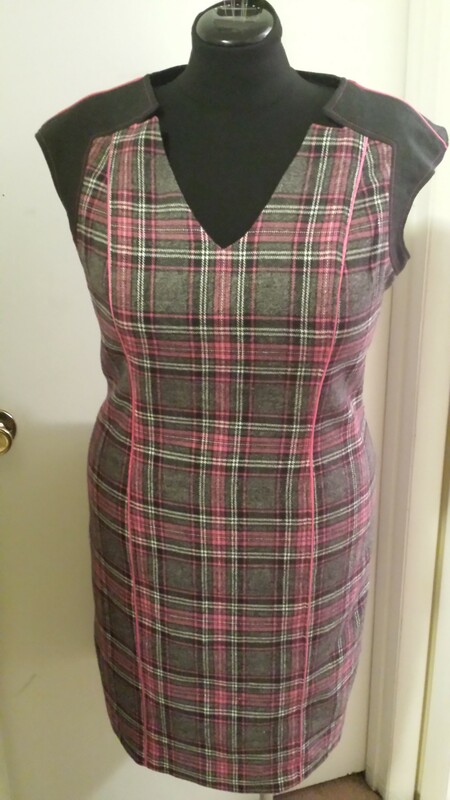 I’ve been working on this sheath dress for the last couple of months and finally finished it last week, so it’s officially my first completed project in 2015! Yay! The biggest challenge with this dress was, of course, ensuring the plaids matched across the seams through all the fittings, refittings, and final adjustments. The other challenge was whether or not to use the pink piping on the princess seams. I thought the pink piping would be a nice touch, but I continued to double-think that decision throughout the entire project. In the end, I’m pretty pleased with the overall effect. The piping doesn’t stick out nearly as much as i thought it would, so I’m glad I stayed with my original plan. Otherwise, I would have fallen back on the “conservative” option and used grey piping instead (ugh!). I just need to keep reminding myself that conservative is boring, and life is definitely too short for boring clothes! The New Year’s resolution is no more boring clothes!